CAMPAIGN is an affordable, battlespace visualization and mission planning tool which enables rapid creation and deployment of military task forces through the use of an intuitive graphical user interface. CAMPAIGN is designed to support Commanders and their Staff during the Military Decision-Making Process (MDMP). Users can visualize the battlespace through tactical overlays over maps and ortho-rectified aerial or satellite imagery. 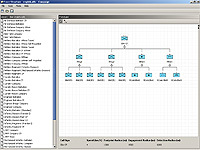 Image shows CAMPAIGN interface for defining the force structure chain of command. CAMPAIGN assists in the development of the military force structure plan, required to neutralize any current and future threats. CAMPAIGN's drawing capability may be used during Course of Action Development to define control measures such as boundaries, FEBA or LD/LC, phase lines, axis of advance, or any other tactical graphic. Image shows CAMPAIGN interface for force deployment on geo-registered raster maps. CAMPAIGN offers a full set of printing and file export options.